SPECIAL ACCESSORIES INCLUDED: Designed by our fitness instructors, it's better to be sore than sorry. Sculpted bodies are made with hard work and sweat, but the latter shouldn't be an impediment anymore. Our handmade non-sweat headband and two high-quality grade hand wraps will allow to focus on your workouts without the need of any towels. We are backing you up - get out there! ALL INCLUSIVE BUNDLE: Gone are the days where you need to go to a gym when you can perform a high-intensity boxing session in your own house in as little as 15 mins! Our comprehensive boxing ball package is perfect for hand eye coordination training and ensures you have a killer workout with minimal equipment needs. IMPROVE REFLEXES: This reflex ball set will improve your reflexes and responsive time as displayed by top athletes. Put on this speed ball set and get ready to knockout any opponent! Provide yourself and your kids with practical defense skills by punching ball that will come handy in any situation. GETS YOU RIPPED IN 15 MINS A DAY: Who needs a gym membership and a trainer when you can tone your arms, chest, shoulders and upper back by this boxing ball on string equipment, innovatively designed to get you ripped in 15 mins a day! We promise that this speed boxing ball set will get you fit within a month. Perfect for kids addicted to video games -- gets them moving! GREAT GIFT FOR EVERY OCCASION: This is a perfect gift for every occasion -- date night for couples, BOX A BALL kids games at parties, fun workout at beach. Why not start your daily workouts with a friend that needs some motivation but is afraid to go to gym? Offer this fitness gadget as a gift to a special friend in need and change their life forever! Because you are looking to upgrade your daily workouts with a high-intensity technique known for the amazing results it has in boxing. The difference between your body today and your body next week is what you do for the next seven days to achieve your goals. Train hard, sweat harder, do one more set of exercise and enjoy the sore muscles. But you don't need endless hours at the gym. 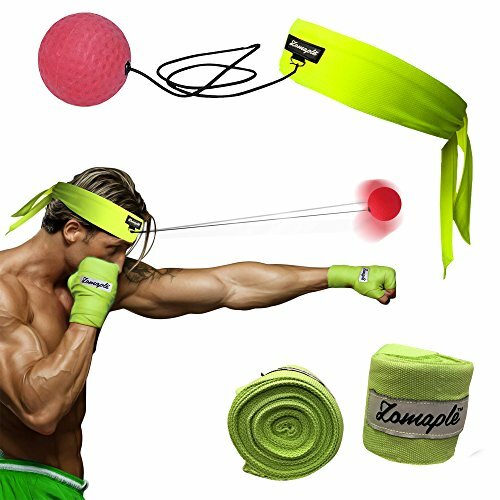 With a premium boxing fight ball reflex bundle that was designed to offer you a high-intensity workout at home, in only 15-30 minutes a day. The workout kit contains a sweatproof headband and arm wraps set, as well as two different boxing reflex balls that will train your entire upper body set of muscles, helping you loose weight and be fit. What is your excuse now? ADD TO CART NOW and enjoy high-intensity trainings at home!